Optoma UHD65 review | What Hi-Fi? Two technologies have become vital for getting the most out of the latest movies and TV shows – 4K resolution, and High Dynamic Range (HDR). But while there’s an increasing number of 4K HDR Blu-rays on the market, and similar content is widely available via streaming, getting compatible projectors – without venturing in to ‘money-no-object’ territory – is a wee bit more challenging. Optoma’s latest projector, the UHD65, is up for that challenge. Even more impressively, it manages to pull it off - and in some style. Giving the UHD65 its 4K capability is one of Texas Instruments’ DLP chips with XPR technology. This chip isn’t native 4K, but rather has a resolution of 4.15m pixels – half that of Ultra HD. However, through a form of pixel shifting, which rapidly fires two lower-resolution images at the screen, it produces a 4K image – or at least a picture manufacturers can claim to be 4K. Alongside that, the projector can handle HDR, providing you with more subtlety in colours gradients than ‘normal’ Blu-rays. While the other HDR formats – like Dolby Vision, or HLG (Hybrid Log-Gamma) for broadcast content – aren’t supported by this projector, it’s still a reasonables spec list. MORE: HDR TV – What is it? How can you get it? Optoma has also added in a ‘SDR [Standard Dynamic Range] to HDR’ conversion setting it says provides enhanced contrast, detail and colours to SDR Blu-rays. However, with this setting enabled the image looks overcooked - and any increase in detail is difficult to make out. As such, we wouldn’t recommend using it. There are two HDMI ports on the back of the UHD65 – one is HDCP2.2-compatible, so will support 4K HDR content – and two VGA connections (for computers), an ethernet port, a USB for powering streaming sticks, and an array of other connections that can control the projector through a home network and make it simple for custom installers to, well, install. You also get a couple of audio ports, including a 3.5mm analogue and digital optical. The Optoma has two 4-watt speakers, but for a rather more enjoyable sound experience we would recommend pairing it with a good sound system. Sound is half of the home cinema experience, after all. Setting up the UHD65 is straightforward. Its backlit remote is easy to use, with dedicated buttons for user configurations and quick access to the projector’s sources. Our one criticism is there are too many buttons, in fact. The ‘3D’ and ‘Keystone’ buttons are useless to this projector, which is a little annoying. The UHD65 is smaller than you might expect for a 4K HDR projector, measuring around 50cm wide and around 30cm deep. The throw ratio comes out at 2.22:1, and the projector has a claimed 1,200,000:1 contrast ratio with 2200 lumens coming from its bulb. Zooming and focusing the lens is all manual, and you access the controls for these by popping open on a flap on the top of the projector. It’s not a particularly elegant design but, once installed, it’s unlikely to bother you again. We dim the lights and set up the projector using a THX Optimizer disc and our Panasonic DMP-UB900 Blu-ray player. After making the usual adjustments regarding brightness and contrast so it looks its best in our room, we dive into the more advanced settings. We move the sharpness up a couple of degrees to get the crispest detail out of the UHD65, and turn off the PureContrast, PureColour and UltraDetail settings. We find the first two make the picture too intense, while UltraDetail brings unnatural sharpness and loses some of the nuance in the process. We put PureMotion onto its lowest setting, though, to make movements a little smoother without looking unnaturally processed. It’s also worth noting that, despite the UHD65 having a Rec.709 colour gamut, Optoma claims the HDR display mode preset actually has a wider colour range than that available on its other settings. Consequently you’ll want to put it into that mode when watching HDR content ,while changing to its Reference mode (or a custom User setting) for SDR viewing. It’s a shame that the UHD65 doesn’t do that automatically. Once set up, the UHD65 has an impressive handling of colour - and really comes into its own during bright scenes. Play Guardians Of The Galaxy Vol.2 and the colourful red and green foliage of Ego’s planet (or Ego himself) pops nicely against the pastel landscape, but still contrasts well against the bright blue-white tendrils of light that catch our heroes’ ship as they land. The difference between Ego and Starlord’s skin-tones and the backdrop of the alien world is carefully balanced, the UHD65 managing to look natural while capturing the vibrancy of the new planet. There’s a good range of hues to Gamora’s green skin and Drax’s purple/red muscles too. It doesn’t skimp on detail either, providing an insightful rendition of Starlord’s hair and the glimmer of cosmic lights in his eyes as Ego tries to brainwash him at the climax of the film. During their final fight scene, lobbing huge rocks at each other or crushing other characters into the dirt, the UHD65 captures the craggy textures and the granularity of earth with precision. As hero and villain fly around the planet’s core, the projector manages to keep up with the rapid movement with surprisingly few alarms. There is occasionally a small amount of noise in some areas, which is a touch distracting - though hardly enough to be a dealbreaker. Compared to some more expensive 4K HDR projectors we've seen, the UHD65 doesn’t extract quite as much detail in dimly lit scenes. It has difficulty making out the fabric of Yondu’s jacket or the minor details in the darker areas of the shot. But we haven’t seen another projector perform this well at this price before. Changing to a Full HD Blu-ray of Pacific Rim, we’re pleased to see the same characteristics. While there’s an expected drop in the range and richness of colours, the UHD65 still provides an enjoyable and insightful image. If you have a collection of DVDs the UHD65 will upscale it adequately, too. There’s significantly less noise on The Truman Show from this projector than we’ve seen from similarly-priced competitors - the image is perfectly watchable. 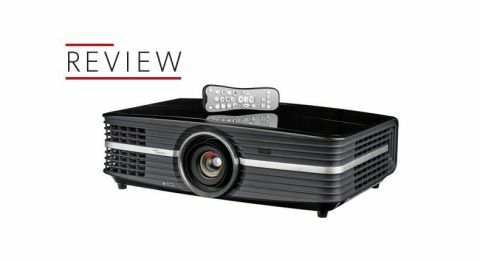 Considering our current favourite projector at this price point, the Sony VPL-HW65ES, is neither 4K- nor HDR-compatible, those looking for a top-notch projector should give the Optoma UHD65 serious consideration. It may not have all the bells and whistles of a high-end 4K projector, but it is future-proof and should keep you happy for years. At this price, the Optoma looks the one to beat.